(TAP Air Portugal, CEIBA, STP Airways, Punto Azul and TAAG – Angola Airlines ) that have regular connections with us. TAP Air Portugal have now 3 flights per week that departs from Lisbon - Portugal on Mondays, Wednesdays and Saturdays. Departs at 11:30h AMfrom Lisbon and arrives at Sao Tome at 19:00 (Local Time). STP Airways have one weekly flight that departs Lisbon – Portugal at Fridays s at 23:30 pm and arrives at São Tomé International Airport at 05:30am (Local time). Both airlines have a one hour stop in São Tomé before they return to Lisbon - Portugal. 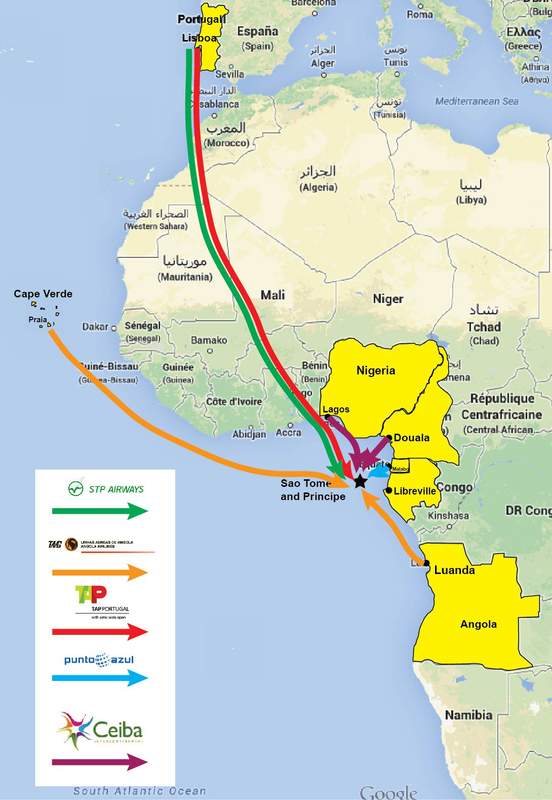 Connections between São Tomé, Luanda and Sal. There are infrequent flights from Douala - Cameroon and Lagos - Nigeria, please contact us for further details. Important Note: Please always check with the Airline dates and times of the desired fligh.